The Northcott is Surry Hills’s biggest public housing estate. For more on the mosaics see Surry Hills 52: the Northcott mosaics. This entry was posted in architecture, colours, Surry Hills. Bookmark the permalink. This is fantastic! Especially considering that it's in a public housing estate, I think it's really wonderful. Wow, that hand mosaic is gorgeous! I am fascinated by the use of quite different sizes and shapes of tiles. Most mosaics I've seen use tiles that are more similar to each other. Thanks everyone for your encouraging comments. 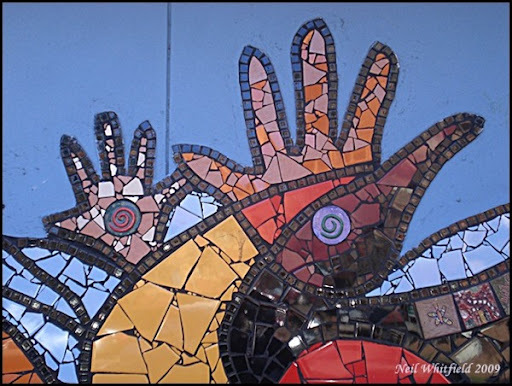 Artists designed the mosaic using Aboriginal motifs. Local people from the estate helped with the installation.